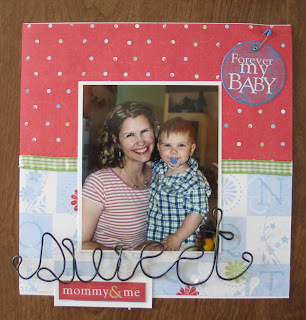 Today I worked on a couple of projects using my new Wire Word Embellishments. The idea is to have some basic examples of how they can be used to show with the individual words when I list them on Etsy. The tag was my first idea. I thought it might look kind of cool to use a wire word as a package add-on. All I did was cut out the tag shape from a piece of scrapbooking paper, roughed it up a bit, and then added a bit of page I'd torn out of a book. Then I tied the tag and the word together with the purple ribbon. 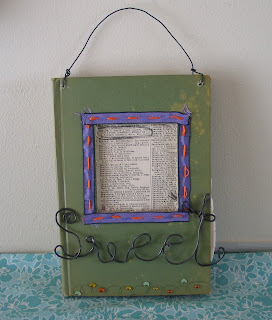 The next project is an example of a 8" x 8" scrapbook page embellished with the wire word "sweet". I thought it turned out rather sweet as well. Here I attatched the word with glue dots. It's going under a page protector so I know it will be supported and protected when I'm flipping through the scrapbook. The last example is a picture frame. 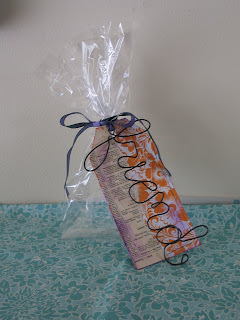 The idea of the altered book base I found in Kelly Rae Roberts book, Taking Flight. It's been a while since I saw it so I don't know how much mine resembled hers, but the basic cut-out was something I found in her oh so fabulous book. So first thing I did was draw out my box. Then using a metal straight edge and a sheetrock knife I made repeated cuts through the cover. I actually kept cutting through the paper until I had a 1/4" depth to my square. I wanted a different text than was actually in the book so I tore out a page from my french-english dictionary. I circled the word famille and then I used a glue stick to adhere the page down. Next, I drilled my holes. I used a hand drill and actually Jasper helped with this part. One hole in each corner going all the way through the book, and then three more holes through the cover only, to attach the wire word below the frame. To determine the placement of these holes I laid the "sweet" where I wanted it and then marked the spots where I planned on stitching the word down. After the drilling I went ahead and stitched the word down with embroidery floss. To reinforce the stitching I taped over the knots on the backside of the cover. I added the stitched ribbon around the frame next, and then did a little doodle and added some bling to the bottom of the cover. To finish, I threaded wire through the top holes and created a simple hanger. This also secured the book together so it can't be opened. This was VERY fun to make. I want to make lots and lots more! Tomorrow I'll add a photo of Jasper looking oh so cute and give it to my grandmother for a birthday gift! Love them Jen - really love them!! They'll be on their way soon! Mini Art Quilts: Whoo- Hoo!